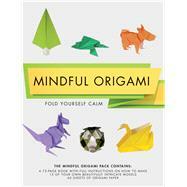 Fold your way to calm with this mindful collection of origami projects! Mastering the intricacies of origami technique gives you more than a creative outlet; it can help calm your mind and relieve the stresses of the day. Along with 40 sheets of specially sourced single-colored origami paper in pastel shades, this pack contains a fully illustrated book with easy-to-follow, step-by-step instructions for 15 beautiful objects. The diverse projects—which range from beginner to more advanced as you progress through the book—include a classic crane, traditional boxes, modular shapes, a contemporary yacht, and movable items like a jumping frog and a talking bear. With just a little practice, you’ll easily make every one! Origami expert Mark Bolitho has been folding for many years and became a member of the British Origami Society in 1983. His fascination with this ancient Japanese art began at the tender age of eight and, after learning the basics, he was soon developing his own, more complicated, models. He is a prolific writer on the subject, with several books under his belt. Many of his beautiful creations have been used in advertisements, articles, and books, and on television.